Reading of newspapers, newsletters, etc. The Library is using Dewey Decimal Classification Scheme (23rd Edition) for classifying the documents. Head of all the Departments. The Committee allocates fund among the Departments to purchase latest edition of books and journal. The recommendations made by the Departments for the purchase of books and journals are placed before the Advisory Committee and on its turn, the Committee approves the recommendations. The Principal, in consultation with Librarian, places the order for purchase. The Librarian takes care of preservation and maintenance of books, journals and periodicals. On the basis of the recommendations of the Committee, the INFLIBNET- NLIST facility is being provided along with a reading room for staff members and students. Further, extension of the Reading Room is being carried out to accommodate more readers. 318 Sq. Mts. including Reading Room (excluding the under construction extension area). 50 seats (at a time). On Saturday: 10.30 A.M. to 3.00 P.M.
Closed on Holidays and Puja Vacation. 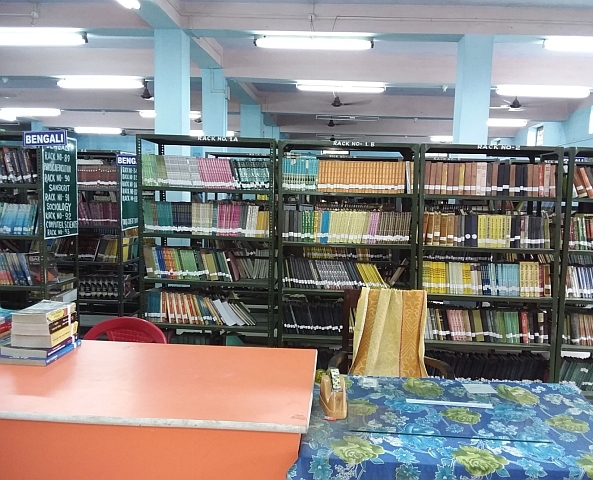 ​The library has separate reading room for the students and staff members. Due to inadequate space in the Library, the facilities like individual reading carrels, lounge area for browsing and relaxed reading are not available. Computer with E-resource is being provided in the Reading Room. The Reading Room is being enlarged in order to accommodate more users.